Oolong is 5 years old and a Tuxedo cat. He is a rescue. He goes by many nicknames including Ooober and Dorka-Orca. Previously, Oolong's past times were playing with toys of all kinds and rubber bands and practicing his escape techniques. He loved to crouch near the door and dash outside at every possible opportunity just to make sure we stayed in shape. Then in August, he accomplished this feat unnoticed and was missing in action for almost 3 months. Someone eventually recognized him from our zillions of posters and called us. So now Oolong is stuck in quarantine while we await his retesting for FIP. He lost 4 lbs on his adventure but has been gaining a pound per week since he has been home. Now Oolong seems to enjoy cuddling and being pet more than anything else! Oh yeah, and FOOD! :) Words cannot even express how happy we are to have him back again! Hopefully he has learned his lesson. P.S. Keep us posted on his FIP test. Ok? Thanks and Happy New Year! You know you are so close to your cat friend when you have nick names. I had several for my best friend and she knew all of them and we also communicated without English. Cats are so cool. It is so good that you have your "Cat Buddy" back again. We, too, have a tuxedo cat that we rescued from the vet. Patches was there for 3 months waiting for a family. She belonged to an elderly couple who had to give up their cat(s) to enter assisted living. 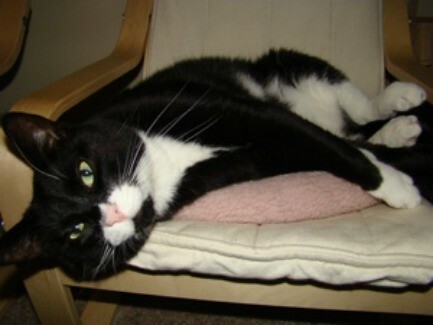 The younger cats were adopted quickly, but Patches was about 3 years old, and not adopted. Our Tuxedo cat should have the name Houdini. I laughed at your description of "practicing his escape". Our cat does this too. Just open the door a bit and she's out! Our grand kids like to tell the story about their Papa going outside in his underwear to grab the cat! Of course they elaborate when telling the tale and it gets funnier and funnier. I'm so happy for you that you got him back. He is adorable. I would be devistated if my Ramsey got out. He did once, but my son caught him before he ventured very far. You seem like a great mommy. Welcome back home, Oolong! Why were you gone soolong? Hope you get a clean bill of health! UPDATE: Oolong was retested for FIP yesterday. Although he still technically tests positive for it, all other indicators suggest that he is only a carrier. He has gained 3.6 lbs since his return which is very promising! There is no way to know for sure that he won't pass it along, but the odds are extremely slim. So the vet gave us the OK to reacquaint him with the rest of our furry family! :) I am looking forward to having him out and about...now we just need to figure out how to keep him in for good! Thank you all for your kind words, we are so lucky to get a second chance with him! I absolutely had to do a double-take when I saw this picture. We own an adopted cat, Doby, that looks like a twin to Oolong. We got him from our local shelter as an adult. They kept him longer than they should have (he was supposed to be euthanized due to the amount of time he was at the shelter) because the shelter director liked him. He wore a beautiful collar that was yellow with blue stones on it, and the director knew that he was someone's pet that had gotten lost, so he did everything that he could to find his owners, to no avail. We've had him over 10 years now, with our share of incidents! We understand how his original owners lost him; he too is an escape artist. We've lost him more than once. Each time, we canvas the neighborhood, talking to everyone we could find, we put fliers at each house, we hung neighborhood posters, we list him missing in the paper, and we even place a large ad--picture and all--in our local paper for months at a time. Yes, when people call, we check out sites, waiting hours in hopes that he'll show up. Luckily, each time, we've found him. The last time he was gone for 2 1/2 months. The lady at the newspaper thought that I was crazy for the listings--we spent a small fortune on them. But after 10 years, he is like part of our family. The last time we found him, he was miles from home. We think he hitched a ride from someone, as he likes to ride in cars and look out the windows. He tested positive for FIV. Luckily, we have a large covered porch where we bought and placed a 6x12 foot dog kennel where we put him when he wants to be out. He can still see the sights and smell the smells, but is safe. We've decided that since he's over 12 years old, he's too old to be lost again, and I think he feels the same. That last experience was traumatic for all of us. Isn't amazing how much you can love a pet!